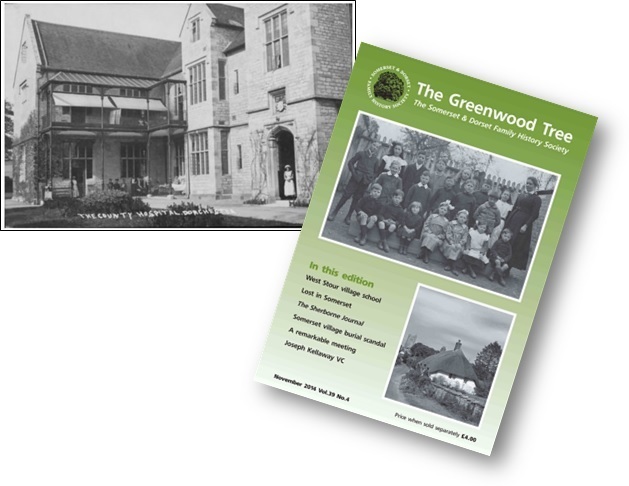 November’s issue of The Greenwood Tree (the journal of the Somerset and Dorset Family History Society) includes an article about this website and the history of the hospital. To read the article, you can join the Somerset and Dorset Family History Society or you can purchase a single issue of their journal (price £4 plus postage). The earliest surviving in-patient admission register for Dorset County Hospital covers the period November 1847 to August 1859. A transcript of the register – with over 3,500 entries – is now complete and available on this website. The transcript gives the patient’s name, age, occupation, parish, and month and year of admission. If the patient died in hospital, this has also been noted. This information will allow researchers to locate the full entry in the original register, which is held by the Dorset History Centre (reference NG/HH/DO(C)/5/2/1). The full entries include the name of the hospital subscriber who nominated the patient, the name of the physician or surgeon treating them, their medical condition and the outcome of their hospital stay. If you identify an ancestor from the transcript, I am very happy to provide you with the full entry from the original register, however I will ask you to make a small donation to either the Dorset County Hospital charity or the Dorset Archives Trust, which supports the work of the Dorset History Centre. The easiest way to search the admission register transcript is to use the Advanced Search facility (opens in a separate window), which returns Google-like results. No responsibility can be accepted for errors – at times, the handwriting is difficult to read. If you spot any mistakes, please contact the site. August’s issue of The Greenwood Tree (the journal of the Somerset and Dorset Family History Society) includes my article on the hospital’s role during the First World War. 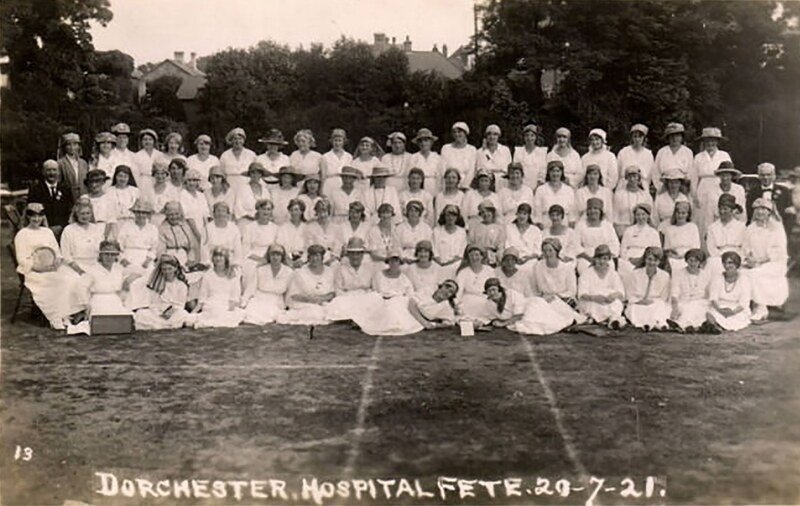 To help the war effort, the hospital offered 120 beds to the military authorities in the main hospital building and at other locations within Dorchester. In total, the hospital and its outposts treated 1,949 service men and 25 German prisoners of war. 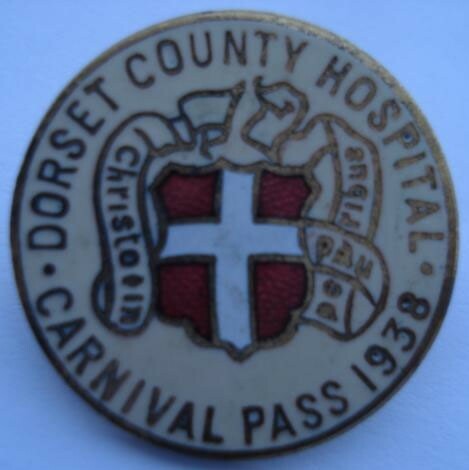 Dorset County Hospital was part of an increasingly well-organised chain of evacua­tion bringing injured men from the field hospitals, to the medical stations in the continental ports, to receiving hospitals on the British mainland, and then onward home. Since this post, the article on Dorset County Hospital’s wartime role has been published on this website here. Hardy had been a subscriber to the hospital since at least 1895, and in 1937 his widow Florence left £800 in her will for the construction of a children’s sun balcony at the hospital. The hospital’s management committee were able to report that the fete alone had raised £1,171 12s. The hospital’s expenditure that year was £6,000. On exactly the same date – 20 July – seventeen years later, another huge fundraising event, a carnival, was staged. During the course of the day, Miss Iris Legg of Wolfeston, Dorchester, “a 16-year-old country girl” was crowned carnival queen. The 1938 festivities made £1,231 19s. 5d. for the hospital, little more than the “fancy fair and fete” seventeen years earlier. The challenge facing the fundraisers had become considerably harder however. The hospital’s spending had nearly doubled since 1921, to £11,780. 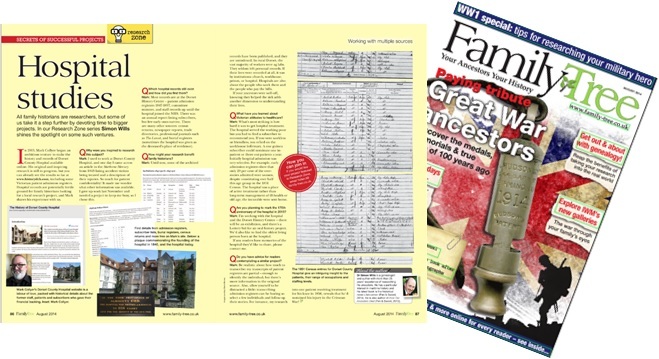 There is terrific coverage of this website in August 2014’s Family Tree magazine – many thanks to the editor, Helen Tovey, and writer Simon Wills, who was a pleasure to deal with. The August edition is on sale now (in all good newsagents!) and you can access it online (a single issue is only £3.99). Q: Are you planning to mark the 175th anniversary of the hospital in 2015? I’m working with the hospital and the Dorset History Centre – there will be an exhibition, and there’s a Lottery bid for an oral history project. We’d also like to find the oldest living person born at the hospital. If any readers have memories of the hospital they’d like to share, please contact me. I am pleased to say someone has already made contact with memories of her father working at the hospital before 1945. If you have any recollections, please do get in contact via this site and your details will be passed to the team at the hospital working on the anniversary celebrations. Many thanks to the Dorset Echo for promoting this site – click to read their article (opens in a new window). As the Echo says, next year is the 175th anniversary of the hospital’s history. 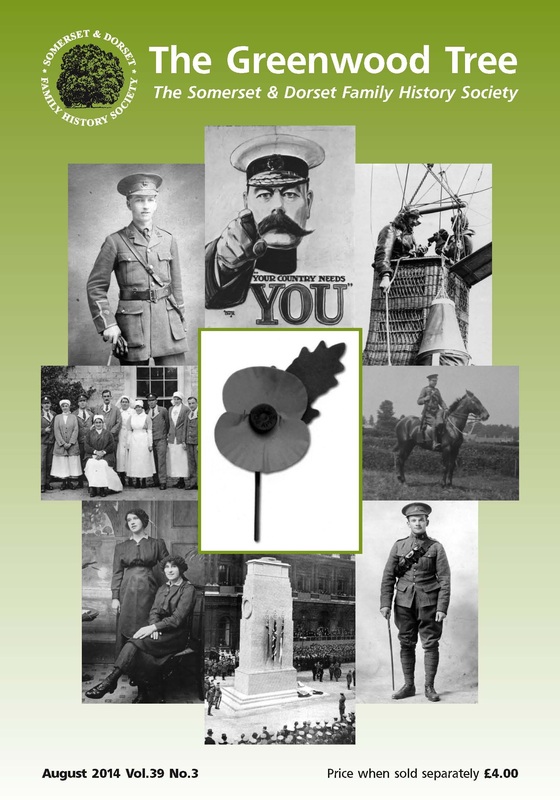 The hospital is working with the Dorset History Centre and the Dorset County Museum to mark the occasion. There will be an exhibition, and there’s a Lottery money bid for an oral history project. They’d also like to find the oldest living person born at the hospital. If you’d like to share any memories of the hospital – as a patient or staff member – please make contact via this site and your details will be passed on. Recently JL contacted me about her ancestress, Lucy Thorne. The transcript of the admission registers, on this site, show that Lucy was aged 36, a labourer’s wife from Stoke Wake, and she was admitted to Dorset County Hospital as an in-patient in March 1851. JL tells me that Lucy married Joseph Thorne in 1834. Joseph’s brothers were transported to Australia for their involvement in the Captain Swing riots. The couple had nine children including a girl named Susan and Lucy died in 1901 aged 88. By consulting the full entry in the admission registers, and by looking at the minutes of the hospital’s Management Committee, I was able to tell JL that Lucy was admitted on 13 March 1851 on the recommendation of Miss Joanna Richards of Stoke Wake. Lucy had pleurodynia – acute inflammation of the chest muscles. Patients often suffer severe pain and tenderness, fever and headache. Lucy was treated by the honorary physician, Dr. Charles Cowdell, and was discharged, cured, on 4 April. The records also show that Lucy’s daughter Susan was admitted to the hospital, aged 9, in December 1849. Susan had a ‘diseased spine’ and there was nothing much the hospital could do. She was discharged as incurable in February 1850 and died later that year. 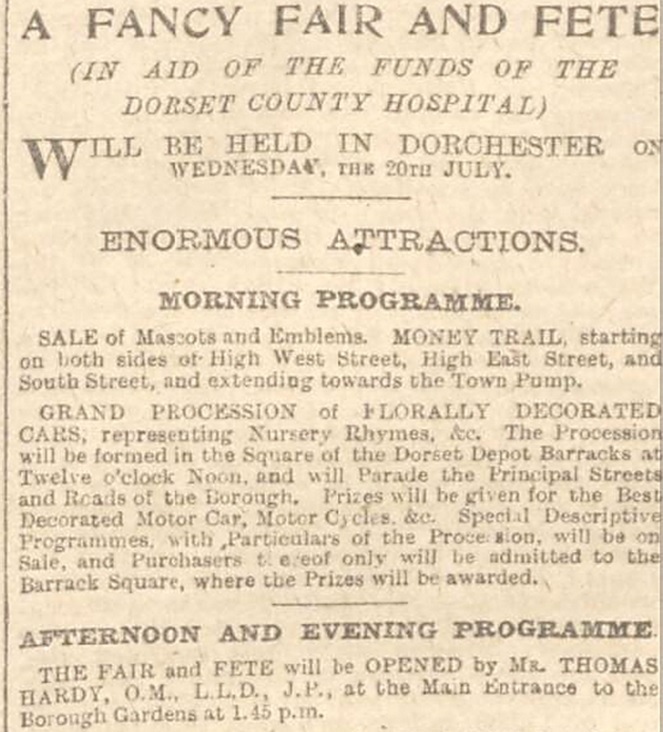 The information was given to JL free of charge, although enquirers are encouraged to make a donation to Dorset County Hospital or the Dorset Archives Trust – but there’s no obligation. JL wrote: “Thank you for all your help … We lost Lucy in 1851, but thanks to you found her at DCH … Thank you again, and I will certainly be giving a donation”. Very gratifying. The cost of treating patients in Dorset County Hospital was met from subscriptions, donations, bequests and church collections. The earliest complete list of subscribers known to survive dates from 1843 (just two years after the hospital opened its doors), and is now available on this site. Further names of early subscribers, who put up money even before the hospital was built, have been extracted from lists published during the winter of 1838-39 in the Sherborne Mercury. These too have now been published. The combined subscriptions lists now available give details of over 1,600 subscriptions. Click on the relevant year or use the Advanced Search facility to search for a specific name: 1838-39 1843 1865 1871. Over a thousand people have now visited this website, but from the statistics, it seems most only visit the admission register pages. This is a mistake! The best approach is to use the Advanced Search facility. This opens in a new window and returns specific Google-like results. The search ‘robot’ updates itself early every Monday morning, so if you can’t find what you are looking for, the search engine may find it the following week. Take the example of John Mellish: finding his name in the admission registers will reveal he was aged 22, from Fordington, was admitted as an in-patient in February 1848 as a result of an accident and he died. But using the Advanced Search facility will point to a newspaper report of his inquest (revealing details of his employer and how the accident happened) and the record of his burial at Holy Trinity, Dorchester. The admission registers only begin in 1847 and so far only a limited number of years have been transcribed. There are many newspaper reports and burial records referring to patients which pre-date 1847. Similarly with staff and benefactors – please use the Advanced Search facility. Staff can appear in census returns, professional journals, newspaper reports, subscriber lists and directory entries – even in the burial registers. Benefactors are likely to be named in the many newspaper reports and subscriber lists. As you’ll have seen, links to other pages or other websites are always in red (except the links to Twitter which are in blue). And finally, beware the vagaries of Dorset place-name spellings – e.g. Piddle/Puddle, Winterborne/Winterbourne, Frome/Froome and the places associated with the River Wey (Weymouth/Waymouth, Upwey/way, Broadwey/way). Happy hunting! This month sees the anniversary of the birth of Florence Nightingale in 1820, an event marked annually by the Florence Nightingale Foundation with a commemorative service at Westminster Abbey. Dorset County Hospital was an early employer of Nightingale-trained nurses. The nurses’ training school at St. Thomas’s Hospital, London, received its first probationers in 1860 and Dorset County Hospital employed its first “Nightingale nurse” in 1863. As the Rev. Charles Bingham, chairman of the management committee, told a meeting of Governors in January 1864: “It has been deemed advisable to avail ourselves of the recent improvements in the principles of nursing, introduced under the auspices of the eminently practical and benevolent Miss Nightingale”. Bingham continued: “A nurse, highly recommended by the Council of the Nightingale Fund, in connexion with St. Thomas’s Hospital, has been procured, and her whole demeanour hitherto has fully justified the cost of the arrangement”. WANTED, a respectable WOMAN, not under 30 years of age, to LEARN the DUTIES and FILL the SITUATION of NURSE at the DORSET COUNTY HOSPITAL, DORCHESTER. She will have to attend the Male Wards under the instruction of the Trained Head Nurse.–Wage to commence at £12 per Annum, to be increased on merit, with Board and Lodging in the House. WANTED, a NURSE, not less than 25 years of age, no more than 40, to be under a trained nurse in the above Institution; wages £12 and all found. It was around this time that the hospital’s managers resolved to put aside up to £20 a year for “deserving nurses disabled by age or infirmity, in the service of the Hospital”. In making the case for this expenditure, medical officer Dr. Charles Cowdell said that, during his fifteen years at the hospital, the health of two nurses had broken down. At that time there was one nurse, still working at the hospital, who had been there thirteen years, “and yet if anything should occur she would be quite unprovided for”. Cowdell contended that something should be done so that, after their employment was over, these nurses would not have to rely on the Poor Law authorities for support. Sadly, the hospital was not always in the vanguard of nursing professionalism: in 1900, The Nursing Record lamented that Dorset County Hospital had “retrograded” by offering a one-year certificate in nursing having previously adopted the three-year standard the profession advocated. Click on the red links to find out more about the Nightingale Fund and the Florence Nightingale Foundation (both open in a new window). … several Out-patients received advice and medicine. The week following, three In-patients were admitted, and the week after that, six more. From that time the numbers increased steadily, and for the first four months maintained an average of 14 In-patients, and during the last four months the full average of 20. The 1841 census reveals that there were twelve patients on the wards on the night of 6 June – six labourers, three servants and three whose occupations were not recorded. Nineteenth-century newspapers seldom mentioned medical patients admitted to Dorset County Hospital, but they would often report on accident cases treated by the hospital’s surgeons. Articles describing 66 accidents during the period 1844-67 have now been uploaded onto this site – see the list at the end of this post. Many of the reports end with the news that the patient was “progressing favourably”. The repeated use of this phrase suggests that the reports were written by the same person, probably the hospital’s house surgeon. Sixty per cent of the accidents happened when the victim was at work, and the name of the employer is often given. The reports remind us how young some of these workers were: for instance, Emanuel Davis of Puddletown, was just nine years old when he was employed as a bird-scarer and broke his leg in 1866. One article reveals that, even as late as 1865, agricultural labourers in Dorset observed the custom of changing service annually on “old Lady-Day”. On one day each year many wagons were to be seen on the roads, conveying labourers, with their families and all their belongings, from their old employments to new engagements. Dorset County Chronicle, 7 February 1867, page 1. Image © THE BRITISH LIBRARY BOARD. ALL RIGHTS RESERVED. Reproduced with kind permission of The British Newspaper Archive (www.britishnewspaperarchives.co.uk). We understand the poor fellow has borne his severe injuries with great bravery and unmurmuring patience. Such mutilation must always be deplorable, even where circumstances place the sufferer beyond the reach of want; how much more when a man’s bread depends upon his daily labour, and where, as in this instance, every worldly prospect is darkened to the last degree? A collection was started and, by June, the “Bridle Fund” had collected enough for a small annuity of about £6 or 2s 2d a week. The 1871 census finds Bridle, living with his parents, described in the language of the time: “Cripple, kept by parish”. The following are the names of the individuals in the accident reports with their ages (or indication of age) and the year of the accident. You can find the relevant newspaper reports(s) by entering the victim’s name in the Advanced Search facility (opens in a new window). Annual subscriptions from individuals, businesses and Poor Law Unions were a major source of funding for Dorset County Hospital. In 1865, a total of £1,101 was raised by subscriptions, representing around 38% of the hospital’s annual income. The list of 554 subscribers for 1865 has now been added to this site. A list of subscribers for 1871 has already been published – click on the red links. These lists are not confined to just Dorset residents: there are, for instance, a number of individuals with London addresses, including the hospital’s architect, Benjamin Ferrey. There are now over 1,500 patient admission records on the site – the published partial transcript of in-patients now covers the period 1847 up to June 1852. The rest of 1852 and half of 1853’s entries have already been transcribed and will be typed and published soon. And more transcribing will take place this week. There’s lots to do! 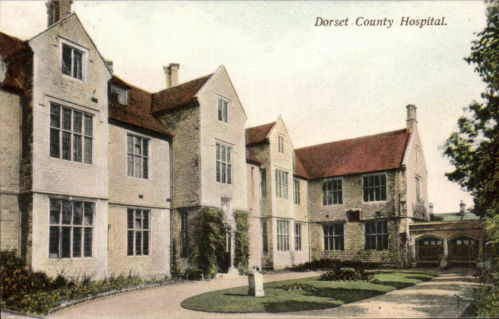 As a voluntary hospital, Dorset County Hospital relied on subscriptions and donations to cover its running costs. Each annual report contained a list of subscribers, but unfortunately very few early annual reports have survived (not surprising as they were just flimsy broadsheets rather than bound volumes). The Dorset History Centre has one of the earliest survivors – dating from 1871 – and the names of subscribers from that report have now been published on this site. Articles relating to Dorset County Hospital published in the Nursing Record (later the British Journal of Nursing) have been uploaded, including a number of articles reporting a dispute at the hospital in the late 1880s about the role of the matron. This dispute led to the hospital employing six matrons in three years. Contributors to the debate included nursing campaigner Ethel Gordon Fenwick (see her article here). Other changes to the site include the addition of a page of useful links. The consolidated indexes of patients and staff have been removed as the thousands of names included were making these unwieldy. To discover if an individual had a connection with the hospital – as a patient, staff member or benefactor – use the advanced search function. Coming next: in-patient admissions for 1852 and an 1871 list of subscribers. Bad weather has prevented travel to Dorset History Centre, meaning that progress on transcribing the admission registers has temporarily halted. Hopefully, more admission records will be uploaded in the next ten days or so. Currently there are 1,295 in-patient or out-patient admissions listed on the site. In the meantime, further Dorset burial registers have been searched for references to Dorset County Hospital patients. The registers for 34 parishes have now been searched, yielding 63 entries for patients. Some of these pre-date the admission registers, and they may be the only surviving record that the individual was a patient. If you come across any burial entries referring to Dorset County Hospital, please contact the site with details.